For businesses and facilities that depend on backup power, it’s critically important to keep power generation systems functioning at top capacity in case a power outage or emergency strikes. Maintenance on power generation systems ensures that they’re ready when they’re needed most – making it vital that customers can easily track maintenance and keep their power systems up and running. That’s why our power generation team offers PM Tracker, a web-based maintenance management system that makes on-going support for power generation systems simple and stress-free. 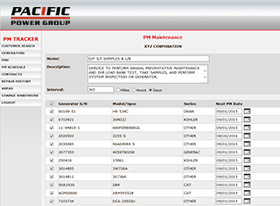 PM Tracker enables Pacific to schedule each individual piece of equipment with its own unique maintenance schedule. As maintenance or service checks are needed, Pacific staff and the customer are notified so that the necessary service can be scheduled. PM Tracker gives customers instantly updated information on their power system maintenance, such as completion of a particular service, flagging any anomalies that may occur, identifying additional services that may be needed and displaying any required follow up. Customers no longer have to keep track of maintenance needs themselves, an added-value for all Pacific power generation customers that saves time and costs. PM Tracker shifts maintenance programs from reacting to issues that occur to proactively planning maintenance – lengthening the life of power generation systems and providing peace of mind. For customers with complex power generation systems or multiple locations with power generation systems, PM Tracker makes maintenance easy. Pacific can track required maintenance and support across multiple generators and locations, and provide updates whenever needed. PM Tracker is just another way that Pacific Power Group provides world-class service and support to our customers. For more information, contact our power generation division.